Humans get to make choices in life, so why can't our dogs do the same? This question has given rise to a new trend in professional dog training -- choice training. As its name suggests, choice training empowers dogs to make their own choices during the training process. Canine students are given the freedom to control everything from whether to participate in a training exercise, to when the session should end. Many canine behaviorists favor extending this to other life activities as well, such as allowing the dog to choose whether to get his nails clipped or which path to take on a walk. Advocates of choice training say that when dogs have greater control over their environment, it reduces stress and bad behavior, leads to a better relationship with their parent/trainer, and actually speeds up the training process. "Life today is strictly regimented for many of our canine companions," notes author/dog trainer Pat Miller (CBCC-KA, CPDT-KA). "Dogs are told what to do from the moment they are allowed to get up in the morning until they are put to bed at night. They have virtually no control over what happens in their world . . . this strict regimentation is a significant contributor to the stress and arousal levels of today's family dog." "Forcing a dog to comply gets you nowhere and actually stops the learning process," agrees trainer Fanna Easter (CPDT-KA, KPA CTP) in her blog for the Animal Behavior College (ABC), a leading national education/certification institute for professional dog trainers. On the other hand, Easter adds, giving dogs the ability to make their own choices "teaches them to trust their pet owners completely." Choice training is a logical extension of where professional dog training has been headed over the past several decades. The shift has been away from punishment-based techniques such as choke chains and prong collars, toward force-free, positive reinforcement methods. Choice training takes the concept of positive reinforcement a step further. It focuses on developing a trusting relationship between the dog and trainer/parent, based on mutual respect, which results in voluntary cooperation. Simply put, dogs are not forced into doing anything, but are rewarded for making the right choice, which increases the likelihood they will engage in the behavior again. There are many ways choice training can be used to shape behavior. In her ABC blog, Easter cites the example of giving dogs a choice of whether to participate in an activity they dislike such as nail trimming. The dog can "choose" to go forward, or not, with each of the small steps leading up to the nail trimming procedure. As a first step, the handler sits on the floor holding delicious treats and calls the dog. If the dog comes over, she is rewarded with a treat. If not, the handler doesn't force the issue, but instead waits and tries again. When the dog eventually finds the treats too tempting to resist and walks over to the handler, she gets a tasty reward. 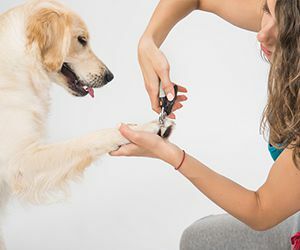 The handler then repeats the process with each successive step -- reaching toward the dog's paw, touching the paw and, finally, trimming the nails. Here again, if the dog backs off or pulls away at any point, the handler doesn't press the issue, but honors the dog's choice. This empowers the dog to "opt out" of the nail trimming procedure at any time. Or the dog can choose to obey and be rewarded. With continued practice - and some irresistible treats - most dogs will eventually make the right choice on their own. More importantly, they'll feel respected and develop a trusting relationship that makes them want to comply with their parent/trainer's wishes. "When pet owners honor their dog's choice, something magical happens," says Easter. "Dogs learn that they're able to stop something scary without becoming aggressive. Also, they learn that their pet owner won't force the issue. This is empowerment at its finest, and it will positively change your dog's behavior." 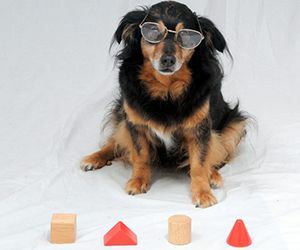 Since most dogs aren't accustomed to making their own choices, Miller suggests getting them familiar with the idea via a game called "You Pick!" The handler holds a delectable treat in one hand and a less desirable food morsel in the other. She lets the dog view and sniff both treats, then closes her fists and says, "You Pick!" When the dog "picks" one hand by sniffing it, the handler opens her fist and lets him eat that treat. Once this has been repeated enough so that the dog understands the game, the choice-making concept can be generalized by putting one of the dog's toys in each hand, instead of treats, and giving the "You Pick!" command. The handler then reinforces the dog's choice by playing with him using the selected toy. "Generalize even further," advises Miller, "by looking for opportunities to ask him to pick - which way on the hike, which food bowl, and even which collar and leash he'd like to wear." Not only is empowering canines to make their own decisions useful in training, she adds, but "we can help our dogs be emotionally healthier by finding ways to give them more choices in the world."